BEST TIME TO VISIT:Autumn, just under unbearable in the summer COMMENTS: Take state road 1176 outside of Brownwood (about 1/2 hour), or drive south from Bangs. This is heart-o'Texas country, rolling hills, elevation about 1350ft., population 12. About 2.5 hours from either Ft.Worth or Austin..
REMAINS: Church, old schoolhouse, cemetery, 4 houses. 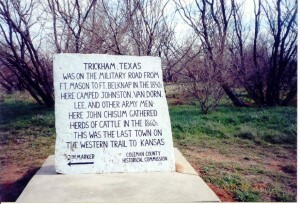 Trickham was originally a saloon stop over on one of John Chilsolm's cattle trails. Established in the early 1860's under the name Muke Water from the local creek, it was renamed "Trick'em" after the one-room frame store/saloon where the local proprietor, Bill Franks, would get the cowboys drunk and trick'em out of their money. 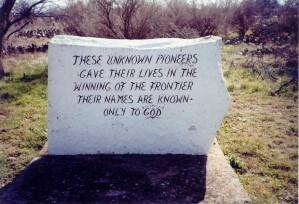 There was an army post nearby to protect the settlers from the Comanches, who killed at least six of them earlier. The Post Office refused to register the name and offered the more polite English Trickham as a substitute. Of course, in central Texas they sound the same. 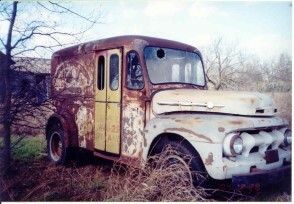 The Post Office was active from April 16, 1879 until July 31, 1958. 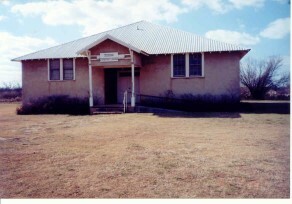 The first and oldest rural schoolhouse in Coleman County still stands, and is used as a rural senior citizens center. Trickham was known for its barbershop quartets, and had one of the first electric co-ops in the state. There is much natural gas, but little oil there, though the first well was found in 1915. See The Texas Handbook for more details. 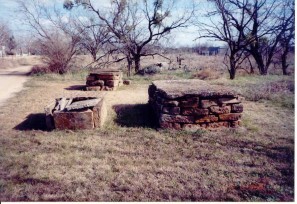 The cememtery contains the unmarked graves of some of the cowhands and the following: Bailey, Banister, Bobo, Cole, Dean, Fiveash, Goodgion, Laughlin, Luswell, McCain, McClatchey, Martin, Mullis, Reager, Stacy, Tankersley, Vaughn. 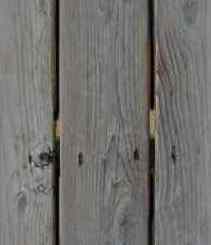 The white stones that outline the history of Trickham that are shown in your pictures are still there, however they are now very much warn and you must take a closer look to make out some of the words. The paint is deteriorating leaving more of the stone showing making it harder to read and some of the letters missing. The stone graves that are shown on your site are current and approachable if you want to take a closer look. I did not see the Church but the Chalk Mountain Lodge has had remodeling done to it and looks like like a newer building. Again, the buildings are not approachable to due to barbed wire seperating you from the buildings. 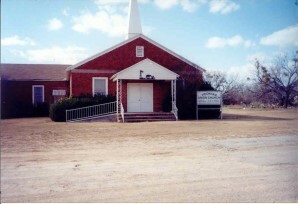 The Church and the Community center looks as if it is being taken care of and in use.